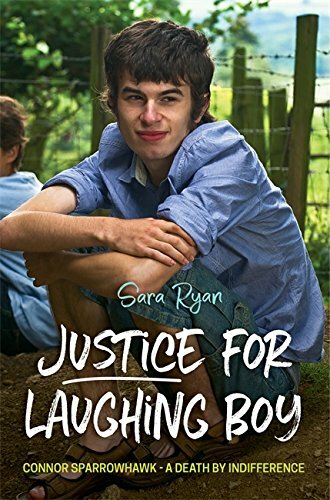 Bit of a shock yesterday when I was told that my book Justice for Laughing Boy is now coming out this Wednesday instead of in October. I’m off to Canada and the US next Sunday for a three week work trip. I was more than comfortable at the thought of being on a different continent in a different time zone when the book hit the shops. I imagined getting back to my hotel after full on days of work with US colleagues and peep-wincing at any comments or feedback from a distance. No. It’s out on Wednesday, followed by an interview on the Radio 4 Today show the following morning. Writing the book has been an odd experience. It was exhausting packing it into weekends and evenings for several months. Revisiting what happened was inevitably distressing and going back to events after a four year gap with the hindsight of what was to unfold has been deeply enraging. So many evenings with me shouting to Rich in the front room another shocking happening I’d forgotten about. … bloody ace, and so feckin measured and hopeful and painful and honest and just oozing love. Once the full draft was written, the real work started as I revised, re-read, revised and restructured endlessly. I cut a lot out as it was too dense, too complicated, too unwieldy for a reader new to the story and the shite that is the NHS sometimes. To carefully document the full story with the packed layers of hell would only appeal to the most doggedly interested, and this book is aimed at a mainstream audience. Connor was always a mainstream dude. What I liked – even enjoyed – about this revision stage was the way in which links and connections emerged between our lives and later events. Connections we hadn’t made but were generated by the process of writing. It became an exercise of carefully stitching over tacking and when the tacking cotton was pulled out, something coherent, strong and reassuring was left. The almost finished manuscript was sent to various people on a list produced by Jessica Kingsley Publishers and endorsements started to trickle in. They were extraordinary and generated more tears. Finally Helena Kennedy QC wrote a foreword that is better than the book. So. Out on Wednesday. Fill your boots. It is a bloody good read and an important one. You can pre-order the book from Amazon as a kindle or a hardcopy here, or you’ll be able to order from Hive from Wednesday onwards and pick up from your local book shop – whichever you prefer. We’d just like as many people as possible to read it so please share far and wide.